Most Americans consider the mango an exotic tropical fruit with the taste of a peach and pineapple. Although it is popular in tropical areas it actually originated in Southeast Asia or India where it has been grown more than 4,000 years. Over the years mango groves have spread to many parts of the tropical and sub-tropical world, where the climate allows the mango to grow best. Mango trees are evergreens that will grow to 60 feet tall. The mango tree will fruit 4 to 6 years after planting. Mango trees require hot, dry periods to set and produce a good crop. Most of the mangos sold in the United States are imported from Mexico, Haiti, the Caribbean and South America. This fruit with its tropical taste also offers the highest amount of beta carotene of any fruit. (Wellness Encyclopedia of Food and Nutrition, 1992). 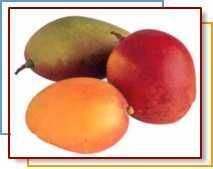 Choose firm plump mangos that give slightly when pressure is applied. Avoid those with bruised or dry and shriveled skin. The ripeness of mangos can be determined by either smelling or squeezing. A ripe mango will have a full, fruity aroma emitting from the stem end. Mangos can be considered ready to eat when slightly soft to the touch and yield to gentle pressure. The best-flavored fruit have a yellow tinge when ripe; however, color may be red, yellow, orange, green, or any combination. Store mangos at room temperature and out of the sun, until ripened. The ideal storage temperature for mangos is 55 degrees F. When stored properly a mango should have a shelf life of 1 to 2 weeks. While the mango will not ripen in the refrigerator, it can be kept chilled there once ripe. Store cut mangos in a plastic bag for no more than 3 days.